Hi Stauer, I just got the new Excursion Dive Watch in the mail today. I love it. 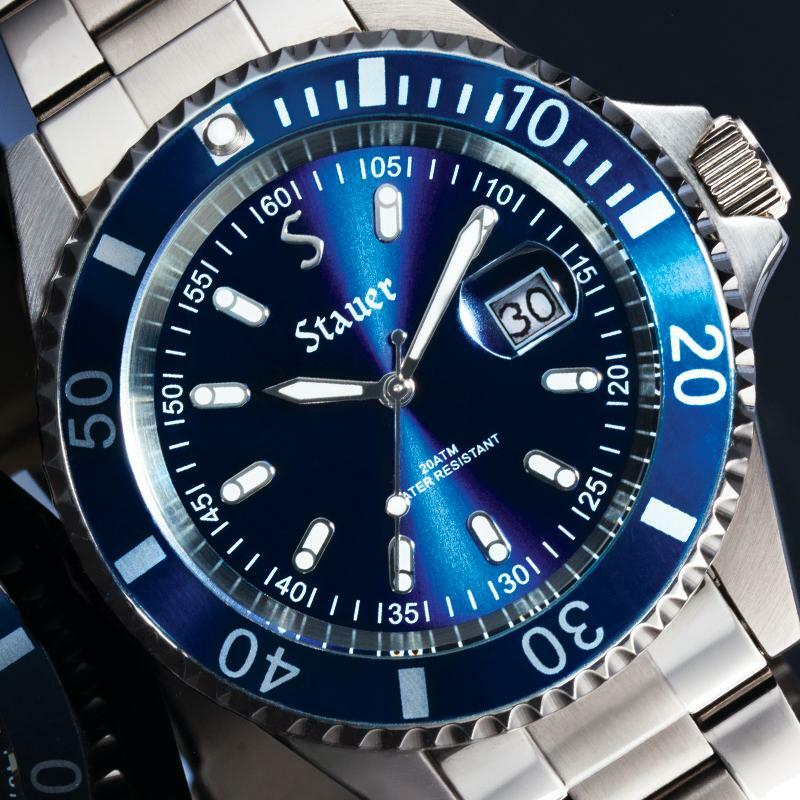 I have several Stauer watches and once again you don't disappoint. Have to admit, at this price, I wasn't certain about this watch. 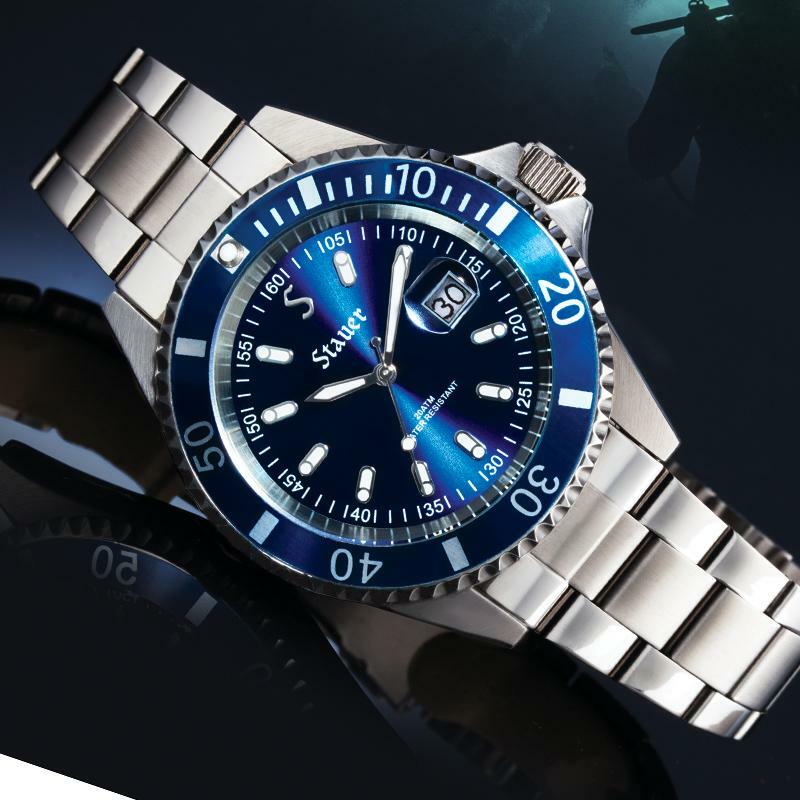 The marketing copy didn't mention it has a rotating bezel... like all real dive watches. I was worried the bezel might be fixed and was for decorative purposes only. Well I was wrong, it does rotate... like a real dive watch. And once again, when I got it, your packaging is just outstanding. Beautiful presentation box, with the watch on a pillow no less. This watch may just become my everyday watch. It has a nice substantial heft to it... not cheap. The crown even is one of those screw down ones. For those concerned about it being too blue... it's really a deep metallic blue... not garish at all. My only criticism might be the band... it sort of tapers from a wider size to more narrow at the clasp. But good for women I guess. I got this watch as a gift. I own multiple watches from you guys. Once again I am never disappointed. I could never run out of compliments for this company. Thanks again for the nice watch. This is "One Nice Watch"! Thank you for offering products which are a lot of fun to own and look as classy as items that cost a great deal of money. Watches are a signature accessory item, they are not necessary for time keeping. Our smart phones, motor vehicles and many other things can provide the date, hour and minutes. Although I am sure some will take advantage of the "Dive" capability of this watch, for me it just adds another look when I am out and about. I own a few watches now... nothing extravagant, however even with that being the case the Stauer watches I now own still have the look and feel of a few watches in my own collection that sell for several times their price. Finally, Thank you for using the pin method of hold the detachable links together. Easier to Deal with. Backed by a 60-Day Satisfaction Guarantee.